As students, it’s really hard to find a balance between schoolwork and cooking. This school year, one of my primary goals was to have filling meals that were not only easy to make but were also healthy for me. One of the most rewarding feelings when you’re watching what you’re eating is actually being able to abide by the dietary rules you set for yourself. By using Trader Joe’s brown rice and quinoa pasta as a substitute for regular white pasta, you’re getting a whopping 5 grams of protein per serving. Being healthy never tasted so good. Fill a large pan with water and add roughly 3 tablespoons of salt. Close the lid of the pan, and let the pan sit on a high flame until the water begins to boil. Once the water begins to boil, add all the pasta to the pan, remove the lid, and lower the heat of the flame to medium-high. Let the pasta cook in the water for 10 to 12 minutes. In the meantime, peel and finely chop the clove of garlic. Wash the broccoli florets and chop any stems, if necessary. Once the pasta is done boiling, drain it in a strainer, and gently pour some cold water over the pasta. Dry the pan you boiled the pasta in, and after placing the pan on a medium-high burner, pour 5 tablespoons of E.V.O.O. into the pan. Add the chopped garlic to the hot oil, and let the garlic cook until it’s golden brown. Once you start to smell the garlic cooking, add all of the broccoli to the pan. Let the broccoli cook until the stems have turned a bright green. Make sure to stir the broccoli and garlic together — otherwise, the garlic will burn. 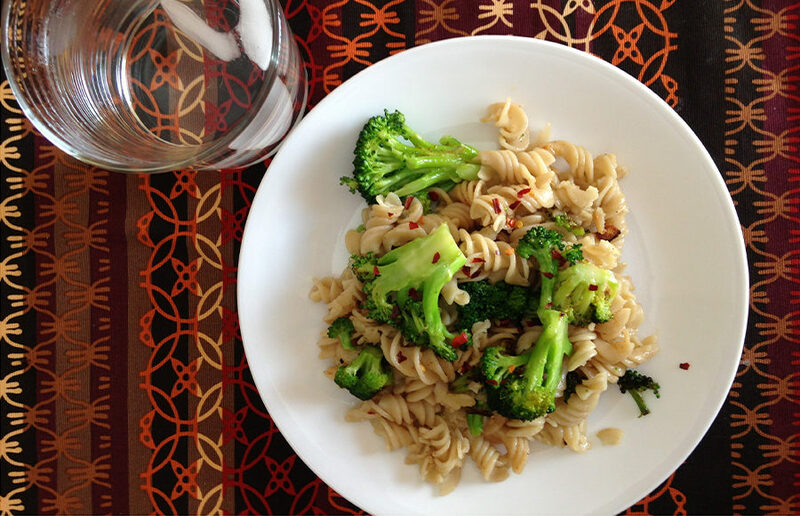 Now, add the cooled-down pasta to the broccoli and garlic, and mix everything together. Pour the remaining 3 tablespoons of E.V.O.O. into the pan, and add salt and paprika to taste. Mix everything together, close the lid, and let the pasta cook for 5 more minutes on a low flame. You’re all done! Add some crushed chili pepper if you want to make the pasta slightly spicy. This quick and easy recipe is perfect for college students. It’s not only healthy but also very filling because the pasta is made out of brown rice and quinoa. This makes for great leftovers that will last you throughout your busy week!